Since our spring and summer seasons are so short in Calgary, I get overly excited about gardening in the few months that I actually have to garden. We just bought our house a year and a half ago and this is my second season with my garden...I need to warn you that I love gardening as much as knitting and there will be many gratuitous posts with garden pictures etc. over the new few months. 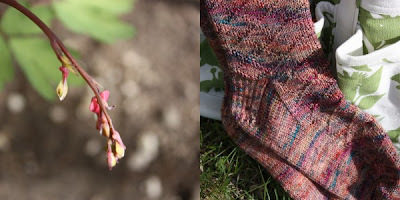 To kick-start my 'gardening' season, I completed these socks from Vintage Socks by Nancy Bush. They are the gentleman's sock with lozenge pattern with some unintended modifications (Oops! I completely missed the pattern for the rib part and did my own typical twisted rib top). I am not too keen on the seams on the back of the socks, which seem to prevail in all the patterns in that book. The yarn is Koigu from the painters palette...not certain which colorway...all I can say is it is not my favorite colorway, however the yarn knitted up nicely. 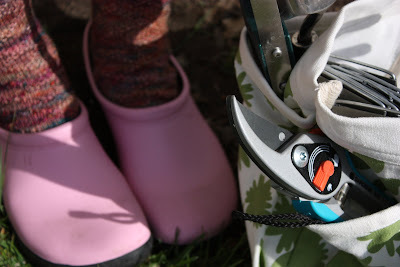 The socks look ready for gardening season tucked into my gardening clogs. The Babe says that I will scare all the birds off with my color combination...I think that I will just camouflage nicely amongst all the pink flowers that will come up...eventually. The bloom pictured above is the first in my garden - bleeding hearts.